Nice, love it when people put that personal touch to their motor. That's because he wants to get home again after he's been shooting. Walshy that wont be a problem as he would probaby never leave the drive . That looks a cracking truck. I hope you have the same light set up for in reverse. I have just traded my hilux after backing it into a gate post and a small bridge trying to reverse down farm tracks. What have you done to the inside? If there is one thing Land Rover get right with the defender its the rubber interior. My Navara is only mid spec but its almost too good for muddy wellys. I have covered everythig with Tarp. Teranno looks good a fantastic engines those 2.7s last forever, wife had a 2.7SE a R reg should never have sold it. I had a 110 van at the time 200tdi the teranno was streets ahead of the land rover in every way. 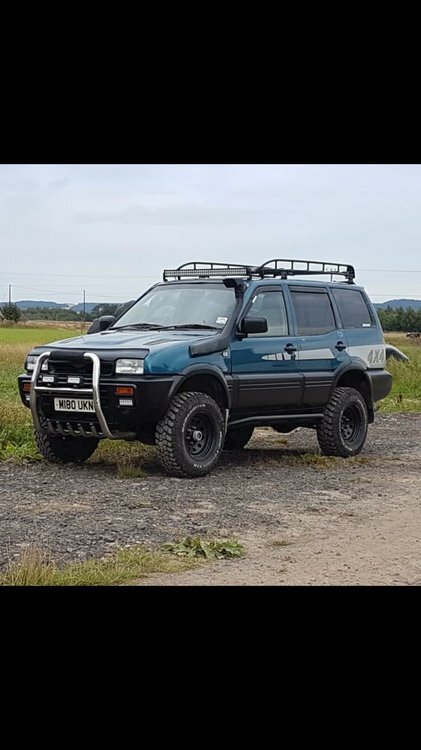 Had five land rovers spanning 35 years had my 200tdi 110 ten years that was the last one i decided enough was enough, i never had such spare time in my life not having to fix the landrover, the wife and me started to have arguments we were seeing that much of one another. So i started going out shooting and fishing more to compensate , we are getting on great again now. Make sure to tell your insurer about any modifications you've made, otherwise you may find your insurance isn't when you come to rely on it. Good work, I knew someone who had fallen foul of this. A really minor modification too, they're slippery *******.